Lets take apart the membrane and examine each of its components. One of the principal types of lipid in the membrane include the phospholipids . These have a polar head group and two hydrocarbon tails. An example of a phospholipid is shown in this figure (right). The top region beginning with the NH3 is the polar group. It is connected by glycerol to two fatty acid tails. 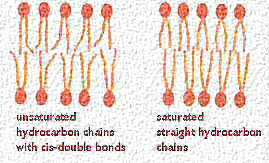 One of the tails is a straight chain fatty acid (saturated). The other has a kink in the tail because of a cis double bond (unsaturated). This kink influences packing and movement in the lateral plane of the membrane. Figure to the left is modified from Alberts et al. Molecular Biology of the Cell, Garland Publishing, N.Y., 1994, Third Edition, Figure 10-10. The figure below is from Wolfe S.L., Molecular and Cellular Biology, Wadsworth Publishing Company, 1993, p 155. 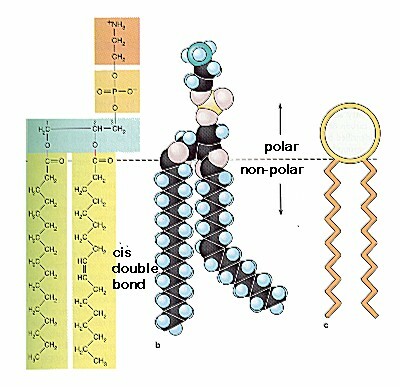 The figure in this paragraph shows how the phospholipids pack together in the two leaflets in the membrane.The presence of the cis double bond makes prevents tight packing and makes the bilayer difficult to freeze. Figure modified from Alberts et al. Molecular Biology of the Cell, Garland Publishing, N.Y., 1994, Third Edition, Figure 10-7. The lipid bilayer gives the membranes its fluid characteristics. The following cartoon shows the effect of temperature on the packing of the hydrocarbons. Note that a low temperatures, the bilayer is in a gel state and tightly packed. 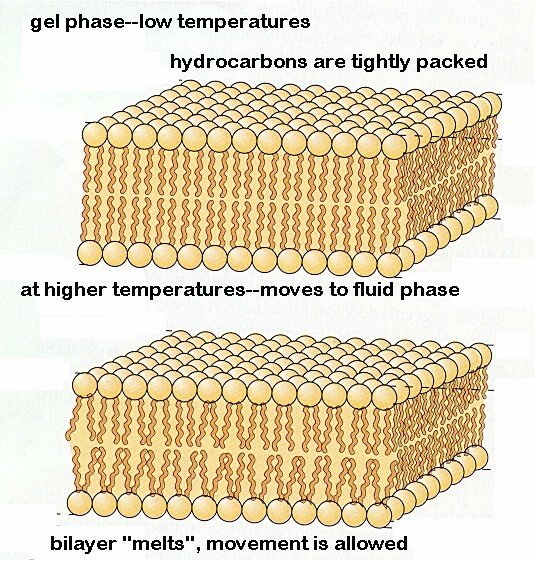 At higher (body) temperatures, the bilayer actually "melts' and the interior is fluid allowing the lipid molecules to move around, rotate, exchange places. This also allows movement of other components of the membrane. The figure below is from Wolfe S.L., Molecular and Cellular Biology, Wadsworth Publishing Company, 1993.